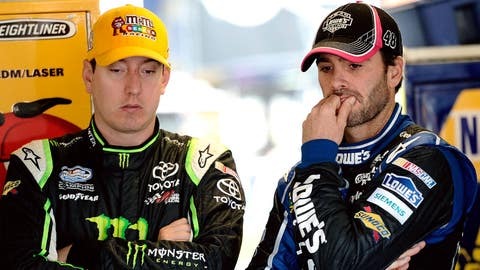 Kyle Busch (left) won four times in 2013 but was no match for Jimmie Johnson (right) in the Chase. One of the curses of the Jimmie Johnson era is that it has eclipsed some great performances from other drivers. When Johnson won his first NASCAR Sprint Cup championship in 2006, Denny Hamlin put together a sensational rookie campaign, finishing third in points. A year later, Clint Bowyer matched Hamlin’s third-place points finish in only his second year in the Sprint Cup Series. In 2008, Carl Edwards won a career-high nine races and was second in points. The following season, Mark Martin ended the year in second place for a record fifth time. Then, in 2010, Hamlin nearly won the title, but had to settle for a career-best runner-up position. That same season, Kevin Harvick was third, his best result to that point in his career. This year, it was Kyle Busch who ended the season a little bit under the radar, despite posting some gaudy numbers. This past season Busch won four races, earned 16 top-five and 22 top-10 finishes and ended the season a career-best fourth in the final NASCAR Sprint Cup points standings. Busch also had some stout numbers moonlighting in other divisions, as he won 12 of 26 races he entered in the NASCAR Nationwide Series and five of 11 in the NASCAR Camping World Truck Series. All told, Busch won 21 races in NASCAR’s top three divisions in 2013, giving him a career total of 126 race victories at the ripe old age of 28. Still, despite a strong Sprint Cup campaign, it was not enough to dislodge Johnson, who won his sixth series title in eight years ahead of Busch’s Joe Gibbs Racing teammate, Matt Kenseth, and Harvick. Busch posted career highs in Sprint Cup poles, with three, and top 10s, and came within one top five of best in that category. It was a very, very good year for Busch overall. But still, that Johnson guy had to go win another championship. Busch said he looked at the year as both his best season and one where he came up a little short. "You look at it and say, ‘Yeah, man, we were really good all year long,’" said Busch. "Jimmie, Matt and myself were the best three cars all year long. We failed to finish third. We wish we would have been there. But all around, it was a really great year. I tied for the most top fives with Jimmie." Busch said he knows what he has to do to finally seal the deal and win that elusive first Sprint Cup title. "The only thing that holds us back, essentially, I feel like, is me getting through traffic," Busch said. "Jimmie’s able to do that better than the rest of us. And if I could do it and pass cars, then I could get to the front and be in the positions that Jimmie’s in more often. That’s one of the things I look at." Busch said he and his team will attempt to redouble their efforts in 2014. 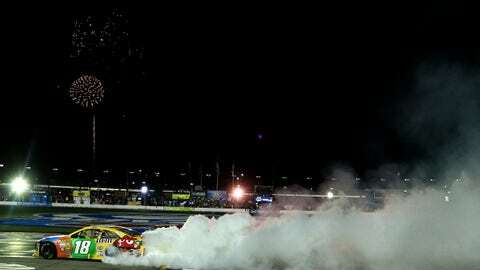 Kyle Busch celebrates with a burnout after winning the AdvoCare 500 at Atlanta Motor Speedway on Sept. 1. "All in all, the bar is the championship, right?" he said. "So we’ve got to raise our game and figure out how to elevate it, whether it’s me, Dave (Rogers, crew chief) or our engineering group or TRD (engine supplier) or whoever it is. "I think it’s all of us. We all have to get better to elevate our game to be champions." Like every top-tier team, JGR is aiming to knock off Johnson in 2014. Busch already had one opportunity get away from him. Back in 2008, his first season with JGR, Busch won a series-leading eight races in NASCAR’s regular season, but tailed off sharply in the Chase for the Sprint Cup, finishing 10th. "That was my year to win the championship," Busch said of the 2008 campaign. "You know when your years are your years. We just failed on that. You never know when that year comes again. You know when it’s yours’. You can feel it. You just have to live in the moment of it and not let the pressure get to you. I think we did a better job of that this year and we learned from last year, missing the Chase. Being able to capitalize and put all that together was good."